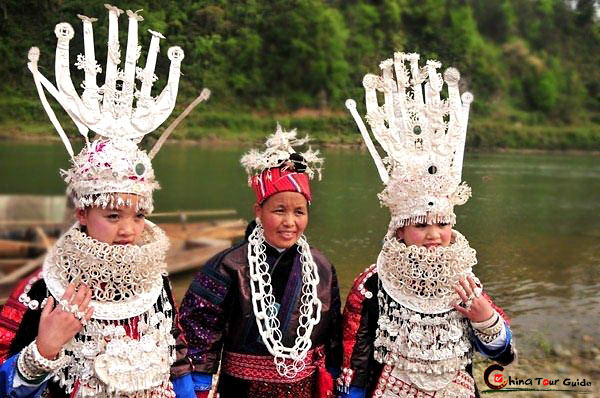 Lying on the southern border Guizhou, Basha village is famed for being China 's last tribe of gunmen. This primitive miao village is hidden away in a forest and filled with stilted wooden houses by the river. Basha village is home to over 1,000 residents living in more than 400 households. Their ancestors were frontline troops who charged through forests and fought the bears there -- all to guard the land where they lived. Through hundreds of years, they have been guarding their homeland. Still today the men in Basha preserve their musketeer heritage, which makes Basha the only tribe that can legally carry real guns in China. A strong sense of precaution inherited from their ancestors keeps this village isolated from the outside world. The villagers lead a self-sufficient life in the hilly areas and retain the dressing and living customs hundreds of years ago. Gun shots going off serves as a welcome signal. Stilted wooden local residences hidden in the lush forest. Basha men are also famous for their unique hairstyles. Like the men in the Qing dynasty, Basha men wear their long hair in braids. They attach great importance to their hair bun, which they believe is a symbol of masculinity, as well as an emblem of power. This is a hairstyle that 's existed for thousands of years. Young boys have to take part in a shaving ceremony between the ages of seven and fifteen. The tribe leader wets a sickle with the water used to boil eggs, and shaves off all of the boy's hair except for the central part, which is coiled into a bun. The blade caresses the scalp, and patches of hair fall to the ground. This shave is done without any shaving cream, or even a rinse. Boys get their first haircuts as a rite of passage, and then are given a hunting rifle at the age of 15 as a sign that they've become adults. 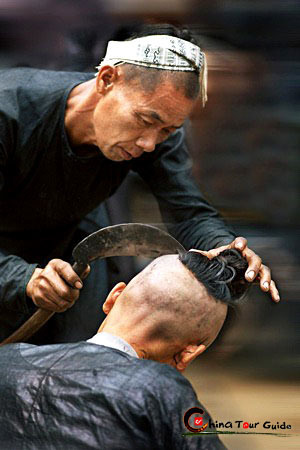 Shaving off the hair with a sickle really needs superb skill. A Basha woman is carrying a basket which is used to hold her baby. The clothes are all made from the home-woven fabrics with the traditional ancient loom. An honest old Basha villager is observing the visitors with his ingenous eyes.